Living in Fukuoka, Kyushu, gives us access to many incredible spots, either in the nearby mountains and tea fields (yes...Yame is only 40min by car...it's like living in Bordeaux for wine lovers ! ), or simply the beach. While we can ride our bikes 10 minutes and splash quickly into close beaches, the one we went on that Sunday is amont our preferred. First of all it's a nice 40 minutes train travel in between the rice paddies and further on along the coast. Usually when we go there, it's for a whole day, so we need to pack a few things to eat...and drink. Now, as you may know summers in Japan not only are brutally hot but very very humid, making it even less bearable. That day it was not yet that hot thanks to a soft breeze, but we knew that playing with the kids in the water almost all day long would certainly drain our energy. So, along with lots of water we brought our cold brewed green tea and decided to take it after lunch and before leaving. Fortunately we brought a tent so we could put everything under shade (even ourselves) and enjoy the view. 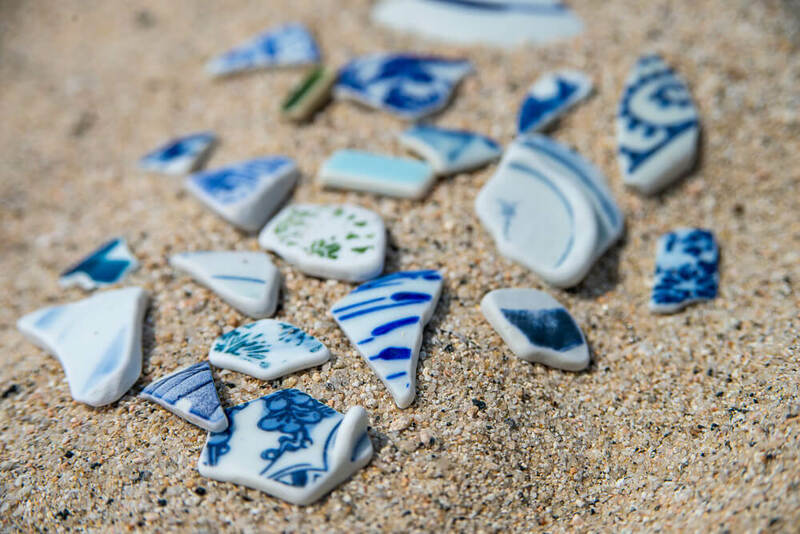 For those of you who have not travelled yet to Japan, it's interesting to know that most of wild beaches are almost empty, and Shikaka Beach is among them. So there were only us (2 families) and...2 fisherman for the whole lovely sand beach stretching over 1km. Shikaka is just a couple of train stops before a very well known city named Karatsu, famous throughout Japan for it's castle and...pottery. There are many famous potters and their kilns (over 70 !) in the area, some of them have been producing since 15 generations !! There are many examples of famous Karatsu teabowls in the tea ceremony, and this popularity can be seen in the building of the Karatsu domain's “Goyogama”, or domain-run kiln for tea ceramics during the Edo period. But these are usually very expensive since they are used for tea ceremonies. 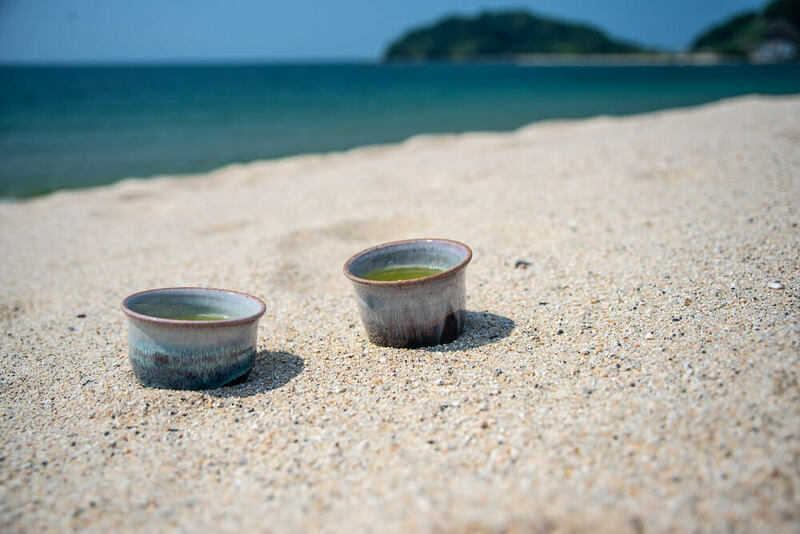 Anyway, we decided to bring some freshly bought tea cups from Karatsu, to enjoy our "IKKYU" time at the beach. It was well worth it, setting a bit aside, enjoying the view and being able to enjoy a good cold sencha like this. Before taking our train back to Fukuoka we had another couple of cups to give us the extra energy needed after a whole day at the beach :) And of course, kid came along and wanted to sip in too ! 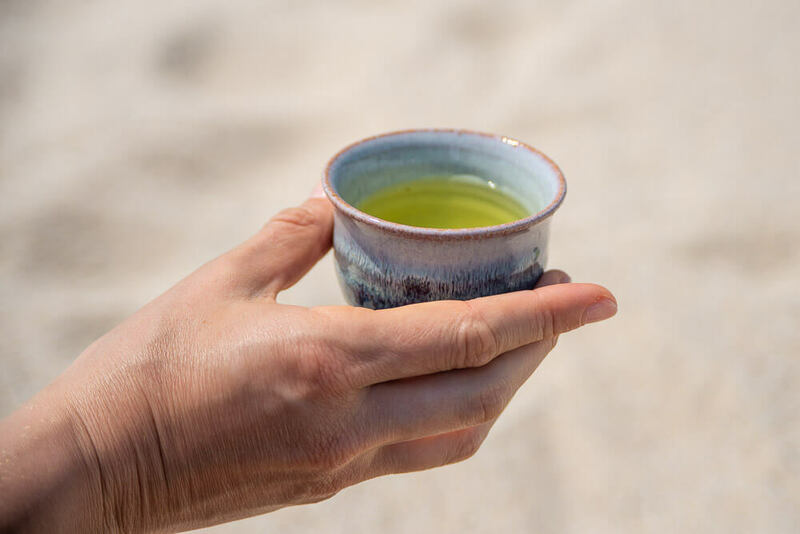 Like these lovely hand-mande tea cups ? They are now available in our shop ! Have a look...and indulge yourself !